The Comfort Hotel Västerås is a modern hotel that offers comfortable and affordable accommodation in central Västerås! The hotel has 149 rooms on 6 floors, a spacious lobby with a barception, a gym and advanced technological services. The new Comfort Hotel Västerås is open and ready to welcome you! Its fabulous location, right next to the central station, means that you're just a short walk from the city centre and the great range of restaurants and shops, as well as the leafy Vasaparken park. The hotel has 149 hotel rooms on 6 floors, a spacious lobby with a barception and a gym. Our hotel rooms is smart and compact, equipped with everything you might need. Choose between moderate, standard, superior, deluxe och XXL rooms. This is the place to enjoy simple and affordable accommodation with comfortable beds and a touch of luxe! Find out more about our room categories here. Those of you travelling with a group of friends or your family can book one of our XXL rooms with eight single beds. These spacious rooms stretch over 42 sqm and feature two bathrooms with a shower. Please note that these rooms must be booked via our barception. Contact information available can be found on the right. Check in and chill out with something delicious to eat or drink from our "barception" - a bar and a reception in one, where you'll be able to buy a range of useful items too. The spacious and accessible lobby will be an ideal venue for informal meetings. And you'll be able to come here to enjoy a coffee or a beer, listen to music and get some work done while you wait for your meeting to start! We will of course have free WiFi all over the hotel. Our barception will be the perfect out-of-office office! Find out more about our barception here. If you like a good workout, then come and work up a sweat in our gym. Or perhaps you like the idea of a nice stroll along Lake Mälaren, just 3 minutes' walk away. If you like travelling light or your clothes need a wash, you can come and use the laundry room with both washing and ironing facilities. At the Comfort Hotel Västerås, we have installed cutting-edge technology to enable you to check in online, on your phone or at one of the check-in terminals at the hotel. You can chat with the reception via WhatsApp or Messenger, and we also accept Swish payments! Great, right? These technological advances mean that we'll have more time to take care of our guests and share our tips on what to do in Västerås! 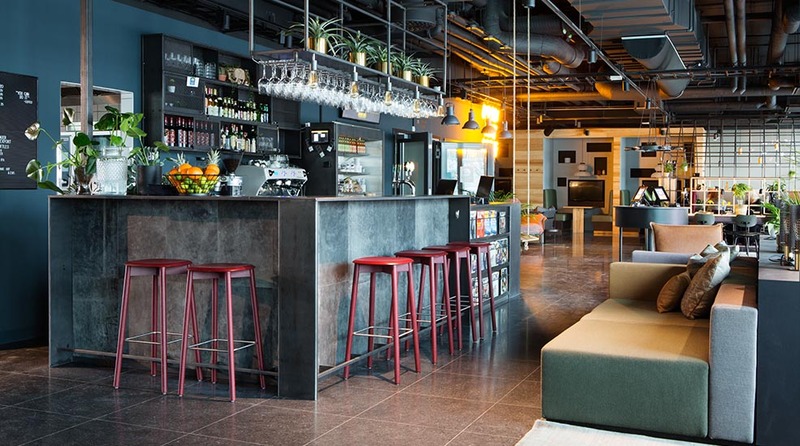 Welcome to the Comfort Hotel Västerås – come and meet the future right here! To view all our hotels in Västerås, please click here. The hotel is right next to Västerås Central Station. Bus from Stockholm Västerås Airport, approx. 20 min. A spacious lobby with plenty of space for meetings and work.